Are We Entering a New Mini Ice Age? Climate change deniers are positively ecstatic about a new model of solar activity presented last week at the National Astronomy Meeting in Llandudno, North Wales. The model, presented by Valentina Zharkova, a professor of mathematics at Northumbria University, indicates the magnitude of the solar cycle will fall by as much as 60% within the next 15 years, to a level not seen since the Maunder Minimum of the 17th and early 18th centuries, a time colloquially known as the "little ice age". This reduction of solar input, the deniers assure us, will bring about a "new mini ice age" and put an end to talk of global warming. Their glee is not unreasonable. If I thought Zharkova's projections indicated something that would have a real effect on the global climate, I'd be ecstatic too. A sharp drop in global temperature would bring us down closer to the historical average that we haven't seen since the early 1980s. Unfortunately, Zharkova's solar model indicates nothing of the sort. Although it's true that a reduction in heat entering the earth's atmosphere will have a slight cooling effect, the reality is that solar input has already been on the decline for about three decades, while global temperatures have been increasing during the same span. These diverging trends indicate that other variables are impacting the earth's climate to a greater degree than solar input. And it's no mystery what these other variables are. John Tyndall first proved the existence of the greenhouse effect more than 150 years ago, and by the end of the 19th century, Svante Arrhenius had published his landmark paper On the Influence of Carbonic Acid in the Air upon the Temperature of the Ground, detailing exactly how much an increase in CO2 would contribute to global temperatures. Scientists have had more than a century to build on Tyndall's and Arrhenius' work, teasing out the relative contributions of various climate inputs. 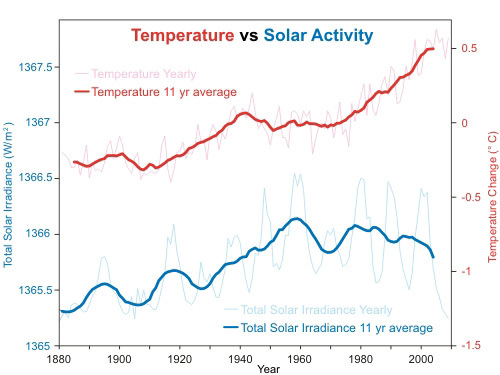 The results are unambiguous: Human activity has a much greater influence over global climate change than does the sun. Assuming Professor Zharkova's calculations are correct, but also assuming we do nothing to curb CO2 emissions in the meantime, we might begin to see a slightly slower rate of increase in global temperatures by 2030, but we won't see a decrease. NASA climatologist Gavin Schmit notes in a comment on his blog that the projected drop in solar input is equivalent to three years' growth in greenhouse gas emissions. Since we're looking at 15 years of emission growth between now and then, there's little chance we'll see a "new mini ice age" or anything remotely resembling one.